Yes, there’s such a thing as “emergency brownies.” I’ve probably talked about them before, now that I think about it. They’re the super-rich-chocolatey-goodness you need this instant without doing any work. Or else you might just expire on the spot from unfulfilled desire for warm chocolate lovin’. I wish I were kidding, but this happens to me regularly, so I know what I’m talking about. You know what I’m talking about? I “grew” this recipe from something else we made at Le Cordon Bleu…something completely unrelated to brownies, because they don’t teach you how to make brownies there, trust me. But they teach you good ideas, and this was one of them that had been gnawing at me ever since we made the French version in the kitchen and devoured it all. It’s a super simple recipe, made with staples you should have in your fridge and pantry. Try it! Preheat oven to 350 degrees Fahrenheit / 170 Celsius. 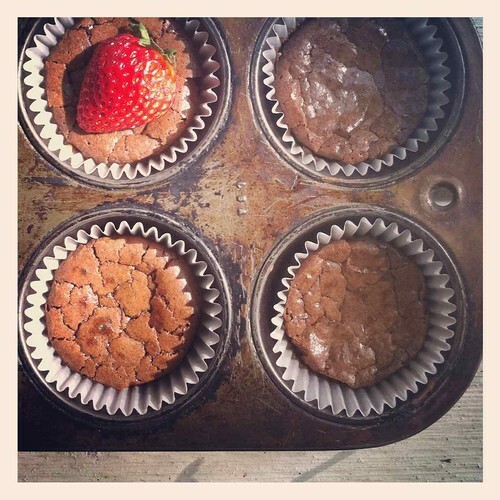 Get out your muffin tin and line 6 cups with your cupcake liner. Melt chocolate and butter together in the microwave or in a double boiler. Whisk egg and sugar together with a hand whisk. Add in vanilla, salt, and coffee granules and whisk well. 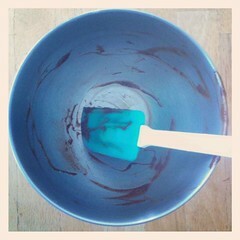 Add in the melted chocolate and butter, mix together just until it’s homogenous. Fold in flour and ground almonds/hazelnuts if you’re using, until there’s no trace of flour left. Stir in mix-in’s if you’re using them. Split the mixture evenly in the 6 cupcake liners you’ve got. 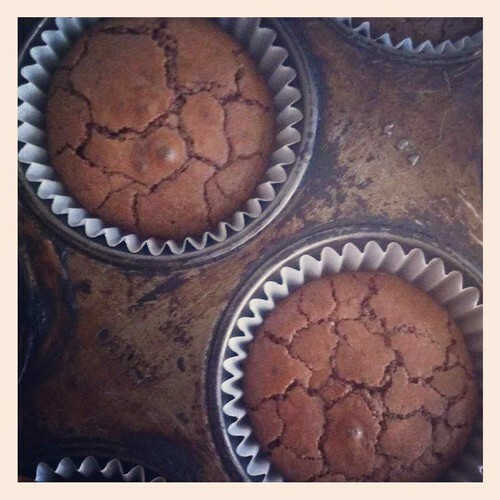 You should be able to fill just under 1 inch in each tin – think brownie height, not muffin height. Bake for 15-20 minutes until the top is crackly and slightly firm to the touch. You don’t want it to be too gooey, and these brownies can’t really over-bake. Remove from oven and let cool in tins until the brownies aren’t too hot to the touch, then move to cooling rack to cool completely. These brownies are not exactly chewy, which I think doesn’t really quality them as brownies, but they definitely hit the spot with their rich chocolate taste. They feel like a flourless chocolate cake done well, but of course they are not flourless. 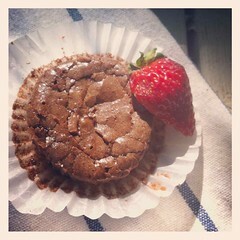 The crackly top is my favourite part – just what I’d expect from any good brownie. The unadulterated chocolate taste and the texture of this brownie also make this a perfect vessel to serve with ice cream and caramel sauce (or fruit coulis?) for a decadent dessert that’s sure to wow your guests. The best part? I’ve also discovered that they freeze exceptionally well – and dare I say they taste even better when frozen? Give them a try the next time your cravings hit! Love. Love, love how this recipe only makes six! Can’t wait to try it (even if my highs are begging me no to).